What are the functions of freight forwarders in international transportation? It would be much more better explaining how international transportation functions in today’s complex global economy, before jumping into the definition of freight forwarders. In international trade goods are being transported from exporting companies to importing companies with different modes of transport such as sea, land, air and rail transportation. If an international carriage can be completed with the utilization of only one mode of transport, this kind of carriage is called single mode transportation. If an international carriage can be completed with the utilization of more than one mode of transport, this kind of carriage is called multimodal transportation. Now we are approaching to the point where the benefits of freight forwarders more apparent. Single mode of transportation can be completed by the carriers who own and operate the transportation means such as sea carriers who own the vessels and operate them under their commercial names. Similarly land carriers own and operate truck fleets. Single mode sea transportation can be completed by a sea carrier. Single mode land transportation can be completed by a land carrier. However, multimodal transportation is not easy to be completed by a single carrier’s abilities. 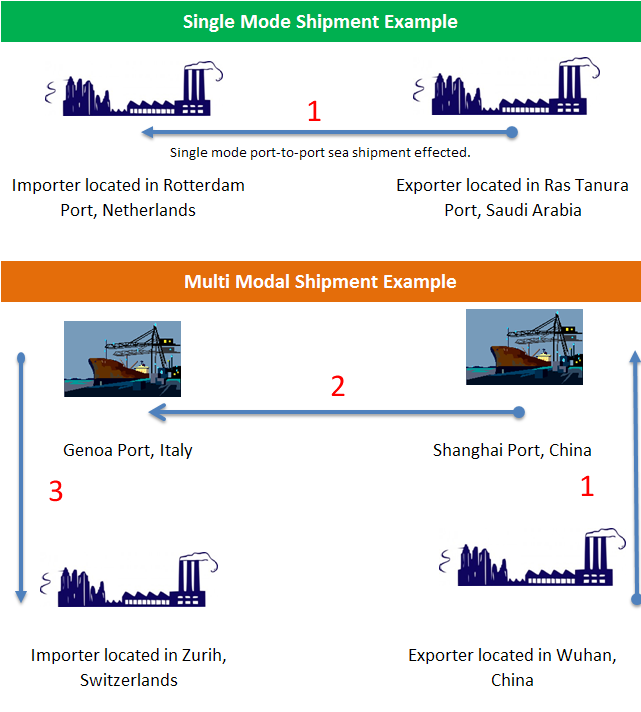 As an example let us assume that an exporter located in Wuhan, China has to transfer the goods to Zurich, Switzerland. First of all exporter need to carry the goods to Shanghai Port with a local transportation, later on the goods must be carried to Genoa Port, Italy with a container vessel and finally goods will be carried to importer’s warehouse in Zurich, Switzerland with land transportation. On this example multimodal shipment must be effected and neither sea carrier nor the local land carriers could handle such an organization. The main function of the freight forwarders arise at this point. They enter the carriage transaction on behalf of the exporters or importers and sign a carriage of contract for each leg of the journey with corresponding carriers. They will offer their clients a turnkey solution which is known as door-to-door shipments. Freight forwarders generally issue a “Freight Forwarder Bill of Lading” or “Fiata Multimodal Bill of Lading”. Freight forwarders can make shipments, which are covering more than one modes of transport under a single bill of lading. Freight forwarders can offer door-to-door shipments under their responsibilities. Freight forwarders can decrease transportation costs by offering more competitive freight quotes. Freight forwarders can increase the efficiency of carriers, exporter and importers by giving professional services during the transportation. Freight forwarders can load “Less Container Loads” of goods by consolidating them into “Full Container Loads”. Freight forwarders can offer storage, handling, packing or distribution services to their clients. Freight forwarders can offer custom breakage services to their clients.